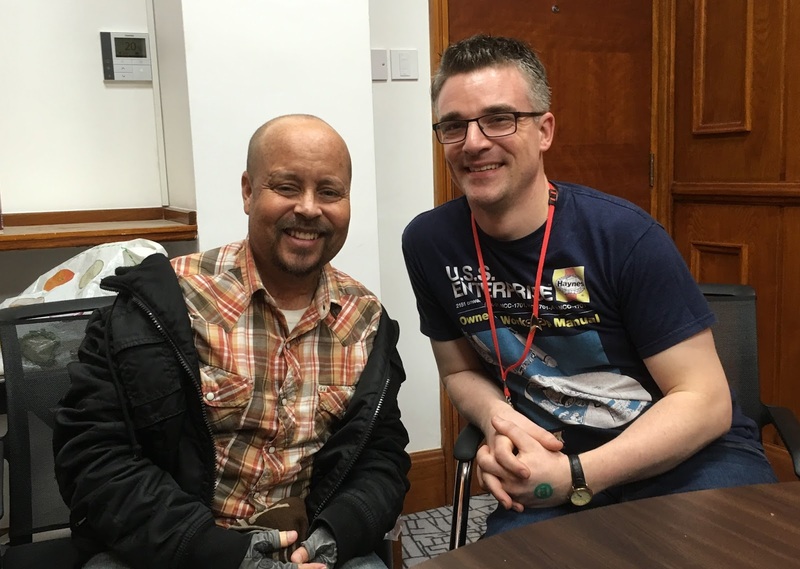 I'm going to kick off and say that Aron Eisenberg is one of the nicest and most accommodating people I have ever interviewed. Fact. Life recently has not been easy for the Nog actor as he explained on stage at First Contact Day 2016. He underwent a kidney transplant in December last year and it really has been a very emotional rollercoaster of a time. But he's fighting back and keen to work. Judging by the seemingly endless queue of people looking for an autograph, he's as popular as ever although it didn't quite start out that way as I discovered. A part of the show from the first episode and almost the first scene, Eisenberg had no idea that his then-unnamed character (referred to as Quark's nephew only in Emissary) would become a recurring role; "I honestly didn't know how long I was going to be on the show or how long they were going to keep writing Nog in. Every episode, I thought, might be my last so even up to the seventh season I thought I could be done at any time. "That's probably my own insecurities thinking this could be it. Once I got to the last episode of season seven I thought that's it I'm in it for the long haul and I was finally able to mellow out a little bit. I was always worried that I would get a script that would have me flying out the airlock if I didn't keep myself at the best level I could." For seven years Eisenberg challenged himself with each story he was given; "The script dictates what I had to do so I couldn't change anything. The challenge never went away because they were always giving me new stuff to work with and it was always wonderful and exciting because they gave me such great stuff to do with Nog. Such a great arc with the pinnacle being Seige of AR-558 and It's Only a Paper Moon which was really the story of Nog. There were more stories done after the show that I would love to explore but I don't know if I'll ever have that opportunity." 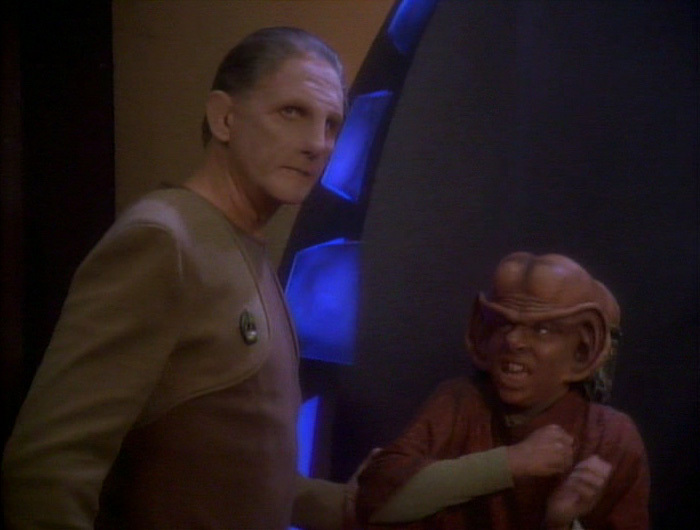 Even in the novels Nog has been a major character such as in the latter stages of The Fall series for example. "I always hoped that some show would bring him back," continued Aron, "but I kinda lost hope with the new show when I heard that it was going back to the original timeline." Whether that jump back to The Undiscovered Country is purely for ethos rather than the setting is still speculative of course but Aron is realistic that his character won't be returning given one speculative idea about the proposed time period. One of the things that always struck me with Deep Space Nine was just how strong the supporting cast was and Aron appeared to agree; "It was such a large cast of people and it needed to be that way because it was on a space station so they had to bring stories to the station rather than The Next Generation that was going to the stories. "Since the station was there they needed people constantly coming in and out...but they still kept everything connected to the story they built the foundations with and we had such a wonderful group of actors that were all immensely talented." Aron is quick to name Marc Alaimo, Casey Biggs, Jeffrey Combs and of course JG Hertzler among the amazing cast that joined the show in recurring roles and made the show the unique Star Trek experience it became. It was a very wonderful show and one of the reasons that the show was so good was because Paramount really didn't care about it. They jumped onto Voyager because it was their sendoff for [the] UPN [network]. We were the black sheep of the family which I think gave a lot more freedom to the writers to tell the stories that they wanted to tell without someone else saying they couldn't do things and got left to their own devices." Deep Space Nine certainly went against the formula when it came to how it used the cast, even giving Nog his own episode in the final season; "They entrusted that episode to me (It's Only a Paper Moon) and I feel I did a god job and I've got many compliments especially from veterans and hats off to the writers for telling that story. At first I was the B story and they couldn't seem to fit enough of what they wanted to into it so they tried to make it the A story with a B story and they still couldn't make it work. They looked at it and asked "what is the story we want to tell?" 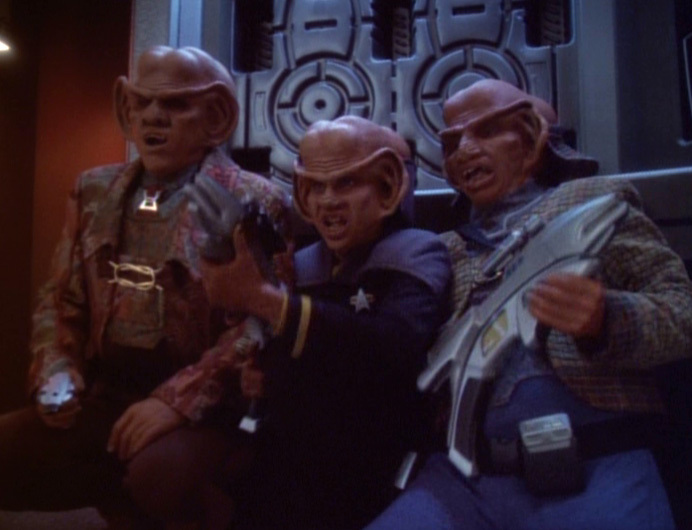 They wanted to tell the story of Nog, a young officer dealing with the effects of war and that's what happened." 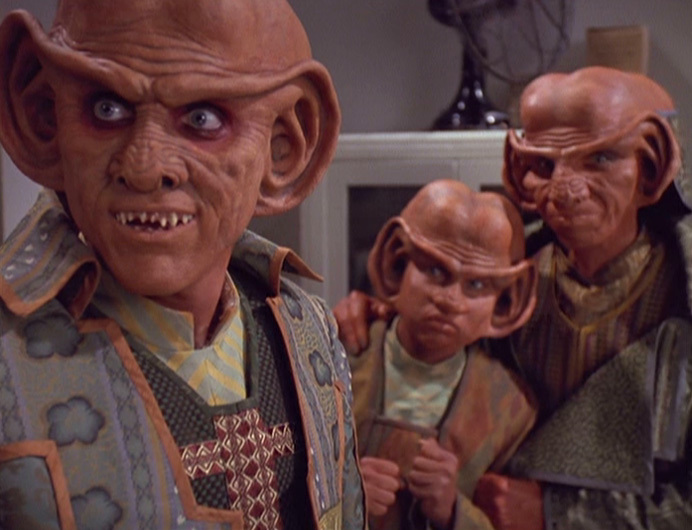 "I was so honoured they trusted me and a few years ago I asked one of the writers why they kept giving me stuff for Nog and he said it was because they knew I could handle it and I kept proving I could do it. I pushed myself to do the best I could and cared about every episode, every scene I was a part of and it paid off because it kept giving me more work. I wish it could have given me more work after the show!" 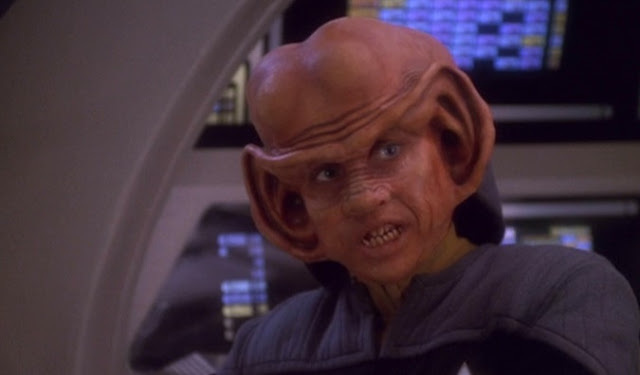 Eisenberg's passion and love for Deep Space Nine is evident in spades as he talks about his experiences which saw his character develop from the thieving nephew of the bar owner to a respected junior officer over the course of the series. 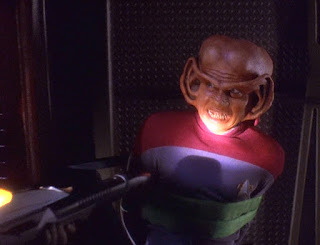 In my personal opinion and something I put to the actor, was that Nog actually had one of the best and most encompassing story arcs of anybody in the show. "Max and I had some of the best character development," recalled Aron, "We did! Sometimes you hear actors talk about their show - and not just in Star Trek - and they don't want to talk about the show that made them famous and brought their celebrity to them. I have the complete opposite point of view on that. I loved that show. I was so blessed to have what I have and if I never work again at least I have that. It's more than a lot of actors can say. I will always be a part of Americana. "During the (FCD) panel we were asked about how it felt to be immortalised [by TV] and when you're asked that you sometimes don't talk about what you want to discuss because you don't want to monopolise other people but the truth of the matter is its amazing to be part of something." So did Star Trek go above Aron's expectations? Was it more than he had hoped it to be? "When you start out as an actor you don't know what the road is going to be. You just want to work and do something you love, be part of shows, to grow, to excel and do the best you can just as anyone in any job; to go up the ranks and do better and something you love to do. That's all I wanted and then to get Star Trek and all these great things and great stories from Heart of Stone to Valiant to It's Only a Paper Moon and to be able to do what I love and have this range - I couldn't have asked for more. Thinking of all those big Nog episodes of which I would also include Empok Nor, Eisenberg had the chance to star alongside such luminaries as Andy Robinson and James Darren. "It was a blessing and to go head to head with these amazing actors was incredible." Eisenberg actually got a call from casting that James Darren wanted to rehearse with him. "I was like wow!" Said Aron who was invited to go over to Darren's house to run through the script for It's Only a Paper Moon. "It led to a stronger relationship with James that I think came through on set and in the episode. With Avery Brooks it was the same. Avery has a very strong personality and it comes across on the screen and it comes across when you're working with him. It's a wonderful feeling working with Avery because he's right there with you and I mean right there." 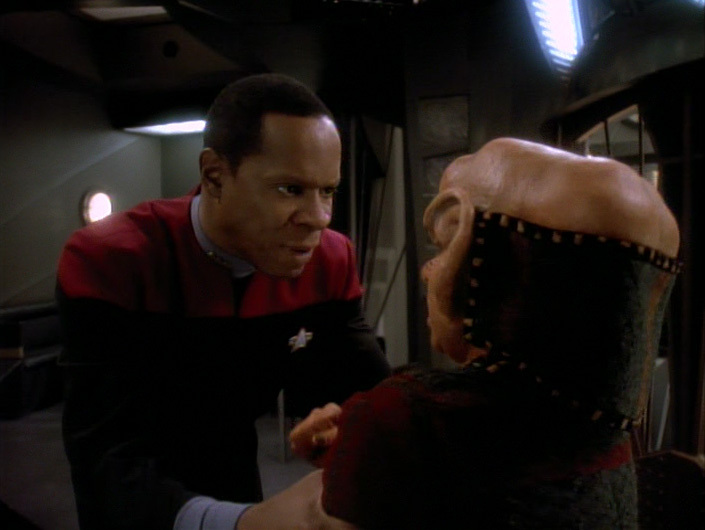 His most memorable experience with the Sisko actor came during the third season of the show just as Nog's Starfleet journey was beginning; "In doing Heart of Stone I remember we rehearsed it with the line "Tell me Nog, what is it you want?" he never grabbed me and in the first take we got to that scene he grabbed me and pulled me into him and I remember thinking "This is awesome, right here, right in the moment!" and I remember telling myself very quickly in a heartbeat that I can either go "holy s**t what's going on?!" or I can run with it. I made the right decision and went with it and it was such a wonderful scene to do because he's right there with you. He throws the ball, you thrown it back, he throws it again and you throw it back." While Aron offers a lot of praise to Brooks for that scene, he's most complimentary in relation to all who were associated with the show; "To be honest you feel that way with everybody. I couldn't have had a better show to work with. The crew was awesome, the production was awesome and the cast was awesome. Sometimes I don't think I can ever get something as good as that ever again." So what's ahead for Aron Eisenberg? Well, he's just out of recovery after his kidney transplant and now trying to find his way back. 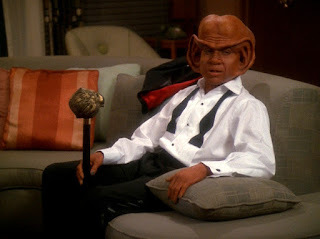 During his First Contact Day talk, Aron talked emotionally about his kidney transplant, how the first kidney had seen him through the birth of his sons and the seven years of Deep Space Nine, willing that it would stay healthy and give him that bit more time before requiring a replacement. "I put acting on the back burner because I was raising my boys," explained Aron whose sons are now 17 and 19. "I really want to get into production and make movies and I miss acting so much. I'm trying to figure out how to get back." 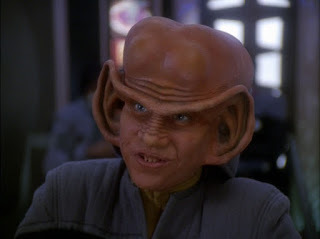 Recent news from the Star Trek lines is that Eisenberg will be returning as Nog in the upcoming second instalment of Renegades. "But it's not just about Nog." he's quick to point out, "I would love to play him again, even in the new TV show but I don't think that's going to happen." So for Aron Eisenberg the future offers a lot of possibilities and it was great to see him looking well and captivating the crowd at First Contact Day. I wish him all the best for the future.